The devotion of the Seven Sorrows of the Blessed Virgin Mary was instituted in the 13th century. It is prayed upon a chaplet made up of seven sections of seven beads. Each section of seven beads is divided from the rest by medals depicting the seven principal sorrows of Mary's life. The Hail Mary is said on each of the beads, with one Our Father said before every seven Hail Marys. At the end of the chaplet, three Hail Marys are to be said, in honor of the Sorrowful Tears of Our Lady. Our Seven Dolors Rosary (or Seven Dolors Chaplet) is crafted of genuine wood beads and is imported direct from Italy. Each chaplet medal contains a full color epoxy image of the Seven Sorrows of the Blessed Virgin Mary. 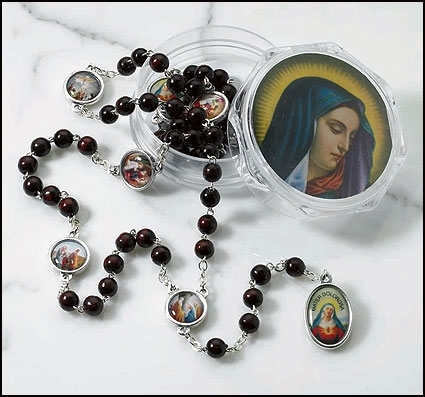 Included with each rosary is a two-piece case with a full color devotional top. The Feast of Our Lady of Seven Sorrows is on September 15. 6) Jesus is Struck by the Lance of a soldier, Taken Down from the Cross and Placed in His Poor Mother's Arms. End the Chaplet with 3 Hail Marys in honor of Our Lady's Tears.